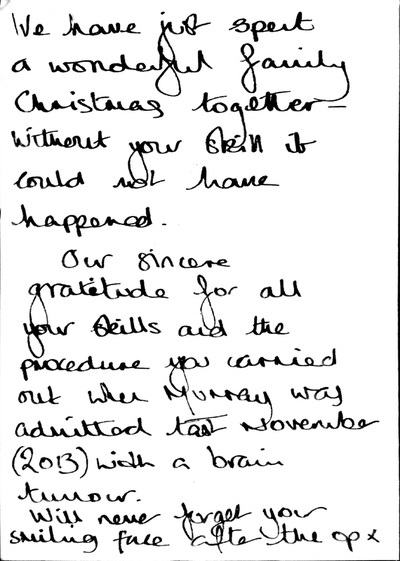 "As a family we are extremely grateful to Mr Chaudhary for the excellent care he provided to our Mum and Nanny in December. My Mum was transferred from Milton Keynes to the JR for emergency surgery on her spine, after she had been left unable to walk due to decompression of the spine caused by a tumour. It was an extremely frightening time for my mum and all of us but Mr Chaudhary instilled us with confidence in his approach and the in the manner he explained the procedure and the possible risks. His kind and compassionate approach made the world of difference to a scared lady and she can now walk, which is amazing and we owe this to Mr Chaudhary and the superb team in Oxford. Thank you!" "As an otherwise fit and healthy 69 year old woman, over a period of 7 months, life rapidly changed and I found myself with chronic leg pain, unable to do normal daily activities, or walk upright without the aid of a stick. Despite my GP's best efforts, the NHS failed to identify the problem....indeed I felt that I was on a very long journey to nowhere.... so I opted for the private route. Following an MRI scan, severe spinal stenosis was diagnosed, and I was advised to see a spinal neurosurgeon for surgery. Like most people, I found the idea of spinal surgery quite scary, so I wanted to ensure I found the very best surgeon for the job! I researched extensively, and eventually decided that Mr B. Roy Chaudhary would probably be the surgeon to see. My initial consultation with Mr Chaudhary reinforced the results of my research. His manner was a balance of friendly informality and confident professionalism. He unhurriedly explained in detail exactly what my MRI had shown, what would happen if nothing was done, and what he would hope to achieve through surgical intervention. He thoroughly detailed the potential complications (however small) of anaesthesia and surgery, without instilling panic! My husband and I were encouraged to ask any questions we wanted to ask, all of which were answered comprehensively. By the end of the lengthy consultation, we were in no doubt that I should opt for the surgery, especially as it would be done via keyhole surgery. However, I was given time before the second consultation to be sure of my decision. At the second consultation, Mr Chaudhary reiterated everything, before I was asked to sign the consent form. He explained that he always operated with Mr Graham Barker as anaesthetist, to provide cohesion. I was relaxed and happy as the provisional date was set. Mr Chaudhary cheerfully told me that by the following Friday I should be walking upright and without a stick. I left the consultation saying "just do the surgery as if I was your mum on the operating table!" On day of the surgery I was admitted to the Manor at midday. I was seen by Mr Barker, who explained the anaesthetic procedure, and Mr Chaudhary himself. All was very relaxed. We all enjoyed a laugh when I told them that they must be "the poster boys" of the Manor Hospital, as everyone I'd met was singing their praises! I went into surgery at 2pm and was back in my room by 6pm (albeit a bit groggy and not 100% with it! ).Both Mr Chaudhary and Mr Barker spent time with my husband, whilst I was with the recovery nurse and my assigned nurse. They explained that the surgery had taken a bit longer than expected, as the stenosis was very severe, but they reassured him that I was OK. They were absolutely right...by 9pm I walked to the patients lounge with my husband...upright and unaided, and in no pain. The following morning, although it was their "day off", both Mr Chaudhary and Mr Barker came to see me and spent some considerable time chatting, ensuring that I was 100% sure about the pain medication, rehabilitation etc They were both clearly delighted that I was up, dressed and ready to go, having had a "Full English" breakfast!! I was then seen by the physiotherapist, discharged and back home less than 24 hours after I'd left!! I've probably rabbited on too much here, but I wanted to emphasise to anyone in a similar situation, that Mr Chaudhary is clearly a very skilled surgeon, and his team are certainly the "go to" people if you have a spinal problem. Their mission seems to be to achieve what the patient wants with the minimal surgical intervention and shortest recovery period. In my case...walking upright, without a stick and no pain. I can't thank them enough." "I was admitted for Keyhole Lumber Tumour Surgery at the Nuffield Orthopaedic Centre, Oxford, on 20th September 2018. Prior to this I had seen Mr Chaudhary for the Pre-Op Assessment when he clearly explained the problem and what he proposed to do about it. He also pointed out what risks may be involved. I had no hesitation in accepting his advice on the matter. On the day of the operation I was impressed by the way his whole team prepared me and must offer my sincere thanks to all involved. Following the operation I was well cared for and prepared for release. It is clear to me that the level of professionalism involved was of the highest order and a credit to the National Health Service. I saw Mr Chaudhary again on 28th November, for a post operative examination when I was able to report an improvement to my condition. He also reassured me about some continuing discomfort I reported and confirmed that in his mind the operation had gone well and that things should continue to settle down in due course. I would like to report therefore that I am highly satisfied in the way I have been treated and am very grateful for a new lease of life." "I was made to feel comfortable and important in a more serious situation than I realised. His manner was curtious, friendly ,reassuring and polite. I had total faith in his ability to fix me and his professionalism. Can't thank him enough"
"Absolutely fantastic! Went out of his way to explain the options and outcomes of the surgery. Was very professional but very caring and went out of his way to treat me as an individual rather than as a cluent/ patient." "I can not thank Mr Chaudhary and his team enough for the amazing care they have given me. I met with Mr Chaudhary around a month ago after researching on line for a good spinal doctor, I am 40 years old and I could hardly walk , sit or stand without excoriating pain. My quality of life was pretty poor, I have always be very fit and active and not being able to put my own socks on or get the milk out of the fridge was starting to drive me crazy. I had seen other doctors and physios that just offered pain killers , acupuncture or exercises but nothing worked the sciatica and numbness just got worse every day and I was starting to think that it was something I would have to just live with. Then I had my appointment with Mr Chaudhary and just looking at me struggling into his office he could see what the problem was , he took the time to go through my MRI with me and explained all the options and recommended L5 /S1 Microdiscectomy . He explained all the risks but I decided that the benefits far outweighed the risks and I went ahead with the surgery 4 days ago. I was up walking around without much pain the following day and 4 days on the sciatica has gone , there’s barely any pain from the surgery. I have intermittent numbness and a bit of aching in my calf and foot but nothing compared to the pain I had 4 days ago. I would highly recommend Mr Chaudhary and his team." My experience with Dr Roy was for a treatment for my husband. My husband had been suffering from static nerve pain for 2 years. He was referred to Dr Roy in a very bad condition. Dr Roy was the first person who took out time to share his MRI reports and actually explain what was going on. He was very patient with my husband who due to the pain was miserable and very moody. Dr Roy shared all possibilities ad also the negative aspects of the surgery in case we wanted to go down that path. He made us feel confident and also knowing all our options was a big deciding factor. I am so thankful to Dr Roy for giving my husband the chance to decide, go through the surgery and be healthy again. 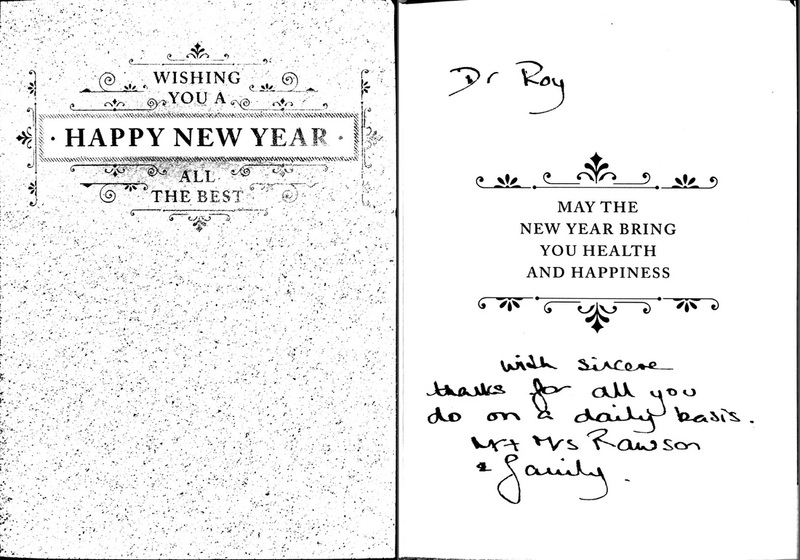 It is a blessing that we met Dr Roy and I wish him all the best and a very special thank you. He said my husband was one of the worst patients and was not sure how the surgery will go but when he came to see me after his surgery, I knew my husband was going to be fine. He gave me an update right after the surgery and was so kind and sympathetic towards me as I was very scared. thank you Dr Roy for taking care of my husband and for making him better again. God bless you. ​"I was refured to Mr chaudhary after not being satisfied with the treatment from another hospital that i was under for about 2 -3 years Mr Chaudhary listened to what i had to say witch was a first for me as i had been used to being ignored he explained every thing well I had my discectomy on the 4th June by key hole was kept in over night then allowed home with medication after 2 days i was not taking any medication as it was not needed.I have got rid of most of the pain i was in and some of the numbness has come back but not all but it is still only 4 weeks since my opp ." 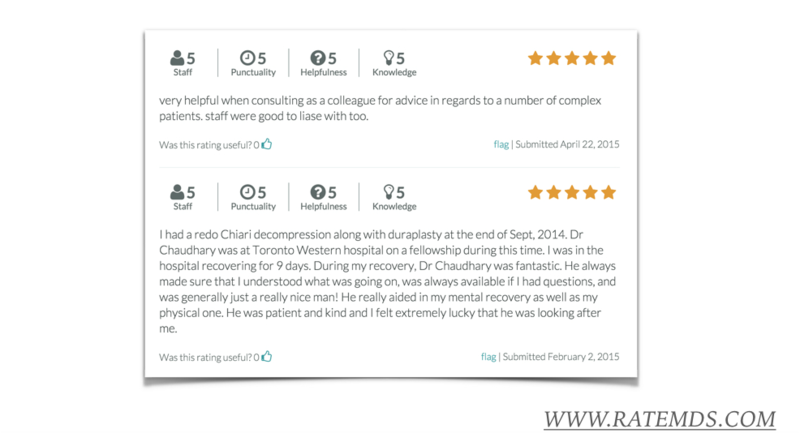 "I cannot praise this Dr highly enough, for his skill, professionalism and expertise. I found Mr Chaudhary sensitive to my needs, caring and kind. I had L4/5 decompression surgery in the morning of Mon 23/7/18, by Mon eve, I was well enough to be discharged. A week,later, I'm walking around unaided. Mr Chaudhary couldn't have given me greater care. He kept me fully informed, I knew what the risks and benefits were of the op, but having met him at my pre-op I knew straight away I was in safe hands. On the day of the op, he visited me several times, before and after surgery, on the whole it was a v positive experience. I wouldn't hesitate to recommend Mr Chaudhary. What could he do to improve? The answer to this is simple, absolutely NOTHING. "My wife found Mr Chaudhary for me using an Internet search, like you. Background: I'd had increasing back pain over the previous 15 months that eventually immobilised me for a while travelling through Hong Kong. I had a MRI there and consulted 2 specialists independently, one orthopaedic, the other a neuro, both of whom specialised in backs etc. They diagnosed a synovial cyst impinging on a nerve and recommended surgery. Subsequently, I also went through the NHS but the general debility meant I went for an earlier op privately. Throughout, Mr Chaudhary was excellent. I can't speak for his professional expertise with a scalpel as I was asleep, however, the result was immediate relief - I walked up 2 flights of steps without restriction for the first time in 15 months within about 3 hours of coming around post-op. His expertise in micro-surgery also means I also have a tiny scar and rehab has been extremely rapid. Obviously, you won't all have my problem but if you're here you'll need what I needed: absolute confidence that the person with a knife next to your spinal chord knows what he's doing and has the skill to do it. Furthermore, his attitude from even before we had our initial consultation was exemplary; his interpersonal communication skills are excellent and, considering he's a busy doctor, as a patient you will never feel rushed or part of a "sausage machine". Moreover, he has a sense of humour! His usual "team" anaesthetist (Graham Barker) was also of similar ilk. So: if you have to go privately your money is being spent wisely; if you're lucky enough to have Mr Chaudhary via the NHS then you're getting even more value for money. Recommended unreservedly." "Dr chaudhary is one amazing doctor he has great empathy and compassion he made me feel like a human being not a number .he gave the time to listen to my issues and genuinely helped guided and resolved my problem"
​"I would recommend Mr b Roy chaudhary he was an excellent doctor. I had keyhole surgery on my spine​ witch was explained in great detail. It was a lot better than open surgery. I was Up and about in no time. I would definitely recommend keyhole surgery .i see improvement almost straight away.doctor chaudhary came to see me after my operation and explained to me about the after care for when i got home .he put me at ease i was not nervous .all the staff we're marvellous i could not fault anyone ." "I came to see Mr Chaudhary for left sided sciatica of 5 months duration.I am a medical professional.Whereas I have not as yet required surgery I would have no hesitation in recommending him.I have found him to be very approachable thoughtful and caring.The skill of a surgeon is to know when and when not not to operate. Whereas given our busy lives we often want immediate solutions sometimes patience is the key, and with backs you have to be very patient.I am now 7 months since my first contact with Mr Chaudhary, and hoping to return to work shortly, I do not have private cover( although saw him initially privately ) however that made little difference to how Mr Chaudhary handled me he was thoroughly professional and very nice and agreeable man as well. Having a significant back problem is a long and lonely journey with no easy solutions,I may as yet still need surgery, if I do I will not be choosing anyone else to help me"
​"From the first consultation onwards, Mr Chaudhary fully explained the procedure and put my mind at rest regarding any anxieties I may have had related to the upcoming surgery. The operation - an anterior cervical discectomy and fusion, and nerve root decompression - went exceptionally well, and for the first time in over a year I was left pain free. I cannot recommend this surgeon enough for his professionalism and for the high quality of care that he provided throughout." ​"Mr Chaudhary worked miracles - he whisked me in for surgery within a week of seeing me for my consultation (at which time I could not walk, crawl, sit or stand and I was taking every painkiller going, including morphine) and I was up and walking with no pain within a couple of hours of surgery. His choice of keyhole surgery has aided my recovery as there has been no pain and the wound site is minuscule which means quicker healing time. I cannot recommend him highly enough and will be eternally grateful for everything he has done for me." "Mr Chaudhary has provided me with excellent treatment from my first consultation all the way through surgery to post operative care. He was extremely attentive to all I had to say and delivered on everything he committed to. My only suggestions for improvement would be for staff in Mr Chaudhary's office to call back following telephone conversations. I had several discussions with 2 different staff members concerning my referral from the Saxon Clinic in Milton Keynes throughout January and early February and had to keep calling back on a weekly cycle for an update. Whilst I accept that the referral failure could have been the failing of Saxon Clinic, Mr Chaudhary's staff had committed to chasing up the Saxon Clinic for information and to getting back to me - this did not happen. Secondly, the MRI transfer took 7 weeks from leaving the Saxon Clinic on 9th January until 27th February for Mr Chaudhary to have sight of it and decide that immediate surgery would be necessary [the provisional date of 23rd March was brought forward to 3rd March]. Improved IT collaboration would benefit." "I would have no hesitation in recommending Mr Chaudray. After my consultation I came away fully understanding what my problem was and what would be done to cure it. I was told all about any complications and possible problems I might have after my surgery but was assured that every care would be taken to avoid these. After the consultation I came away knowing that I could trust Mr Chaudray fully. Several questions were put to Mr Chaudray about aftercare,pain relief, physoitherapy and length of time for recovery and all were answered positively. My surgery went ahead successfully and the only thing that was different to what I was expecting was the length of time I spent in hospital as extra care was taken to avoid any complications." "Mr B Roy Chaudhary is very helpful and kind. I was warmed up to his friendly personality instantly. He made me feel at ease straight away and explained to me all I needed to know about my neck condition. I was very impressed with his great knowledge and advice on how to deal with my condition and what to expect long term. Thank you and Happy New Year!" "I felt very well looked after by Mr Chaudhary from the first moment on. He explained very well the benefits and risks of the procedure and even if the final decision was mine I didn’t felt left alone but accompanied through the whole process. A very caring, professional and extremely skilled doctor who is going the extra mile for his patients. Truly a 5 star experience. I have read in his reviews that someone flew around the world to be treated by him and I fully understand now why and would do the same. Thank you!" "Mr Chaudhary is a very friendly and caring person. Not a requirement when you are looking for a good surgeon, but it really helps make the whole experience easier. He listens carefully to your issues and very quickly had clear plan and set of treatment alternatives. I had been suffering for 2 weeks by the time I met him and with all the pre-diagnosis, I was in hospital and being operated on within 2 weeks. I could not have asked for more. On top of all the above, and having gone through open spine surgery twice before, Mr Chaudharys exceptional minimally invasive keyhole surgery skills are second to none! If my back and nerves had not been in such a bad state by the time I saw him, I would have been out of hospital the same day as the operation. It turned out I was walking by lunchtime the next day and was discharged the second evening. I have a tiny wound with very little pain and bruising and extremely minimal chance of infection thanks to his incredible skills, care and attention to detail. Thank you so much Mr Chaudhary!." "Mr B Roy Chaudhary is an incredible man, less than three weeks after first meeting him he removed a tumour from my spine with the assistance of a superb team at the John Radcliffe Hospital. From the outset his manner, knowledge and enthusiasm were positively reassuring. The risks associated with the surgery were highlighted and clearly explained. Mr Chaudhary's confidence and energy convinced me that he was going to do the best he could and he did. After months of pain, limited mobility, sleepless nights and the unpleasant side effects associated with strong painkillers, a seven hour operation stopped the suffering immediately and with minimal nerve damage. A small part of my left heel is slightly numb but overall the transformation is miraculous. Although still recovering, physically and mentally the improvement is immense. If Mr Chaudhary is helping you then you are fortunate indeed, I would be very surprised if you could find a better spinal surgeon. Mr Chaudhary has given my life back to me, thank you very much." "Without this key hole surgery to my spine it would take me longer to recover and take up a valuable bed space. Mr B Roy Chaudhary has great patient skills and extremely talented surgeon his team is without doubt exemplary. The nhs would be lost without doctors like him"
"Mr Roy Choudhary really tried to get to the bottom of my back problem by exploring all possible avenues to determine what the cause may be, not something I was offered in my own country of residence. This extended to the operation itself where he worked in conjunction with another surgeon to get the best possible result and employed specialist equipment/neurologist to monitor electric activity in my nerve during the procedure. Additionally, the reputation of the Anaesthetist was such that the operation was booked on his actual availability. It certainly felt that everything that could be done for my benefit was engaged to the fullest extent to produce the best possible outcome. Roy's fine reputation is fully justified and I've never had any doubt travelling halfway across the globe to be operated on by him was the best decision I could have made and in itself is the greatest compliment I can make. Thank You." "I had my operation on the 18th July 2017.Prior to this I had a couple of appointments where I was was well informed on all aspects of the operation, what the operation entailed, how I could feel afterwards, (the best scenario and the worst scenario) and that possibly it could be more preventative than cure. as the nerve damage may be permanent. Mr Chaudhary saw me just before the operation just to reassure me.Mr Chaudhary visited me later that day to check all was well. I was allowed home the following day. I had a six week check up and then saw Mr Chaudhary six weeks later. The only thing I wasn't aware of, and possibly no-one has ever said before, but after the operation the muscles at the top of my arms were solid and this was more painful than where my neck had been cut, I am now having physio just to help the tops of my arms, and strengthen my neck. I have a follow up appointment with Mr Chaudhary in six months." "Following an accident resulting in, amongst other traumas, spinal damage, I feel I was very fortunate that Mr Chaudhary was the Consultant on duty. I believe his lateral and holistic thinking, not simply taking the obvious option, resulted in a far better and less traumatic outcome, with lower overall risk, than was otherwise likely. I am most grateful to Mr Chaudhary for the care with which he applied his expertise and experience and would certainly seek his advice should I ever be in a position where I needed another spinal consultation. Mr Chaudhary's ability to engage with his patients coupled with his quiet and confident style is most reassuring when a one finds oneself so helpless and reliant on others as is the case following a serious traumatic incident. One minor point for improvement worth consideration: It was difficult to both contact and arrange follow-up consultations with Mr Chaudhary in the weeks following discharge from hospital." "Mr B Roy Chaudhary, is a fantastic Doctor. He has such a nice manner about him that he relaxes you as soon as you go in and see him. He is very good at speaking to you about your condition in a way that you understand and he basically tells you as it is. I was very impressed with him as his diagnosis was spot on and explains fully as to the type of treatment you require. He is one friendly very clever guy and I rate him completely. Thank you Mr B Roy Chaudhary for everything you have done for me up to now and I will be staying with you right to the end so hope fully you can fix me properly so I can do a marathon again. All the best!" "From the first time we met until the sign off appointment Mr Chaudhary was friendly professional helpful and knowledgeable. He listened to me and we discussed all aspects of the issues and treatments, including risks for and against. Agreed a plan which has been followed to a successful conclusion. At no time did I feel outside the loop of control. I felt from start to finish as a person not just a medical symptom. A heartfelt THANK YOU to a skilled surgeon. Keep up the great work!" "I would just like to say a very big thank you to Mr B Roy Chaudhary and his colleagues. My keyhole surgery was amazing, I was up and able to walk around within hours of the operation which was L5/S1 interlaminar space and left S1 nerve root decompression. Its three weeks on and I am still recovering but feel so much better than before. I would also like to thank the lovely nurse in Recovery called Debbie, she is very kind and caring." "Referred to Mr Chaudhary following eight months of debilitating and excrutiating sciatica, where I was unable to stand upright due to pain. I was examined thoroughly and it was arranged for further scans to be performed. All the while, Mr Chaudhary explained his findings, and the possible procedures that could take place. It resulted in L5/S1 decompression and discectomy, performed by keyhole surgery. I arrived at the hospital at 6am, with my surgery performed later in the day. My aftercare was superb, and the following day was on my feet, standing more errect than I had in many months! The physiotherapist visited me pm to challenge me on several tasks, all which I carried out successfully. After assuring that I had a lift home, and that I wouldn't be on my own when I arrived there, I was discharged that day, some 26 hours after surgery! I cannot praise Mr Chaudhary enough. He is pleasant and not brusque. He explains in great detail the diagnosis, prognosis and even the possible problems that may occur. The keyhole procedure is innovative and, in my case, totally successful. This method of surgery reduces use of NHS resources by so much, taking bed usage from maybe a week to 36 hours, together with the nursing and aftercare. I think it is wonderful and am totally a fan." "Mr Chaudhary assisted me through my recent neck surgery. He made the decision to operate from the clinical evidence on my record. I was in immense pain for over 11 months and was very anxious that the condition was not going to be treated as I had previously been referred to pain management. I saw Mr Chaudhary in his private clinic and he agreed to see me as an nhs patient as I had already been referred to his list but the waiting time was over 2 months. He was very reassuring and provided me with exceptional reassurance and explained the risks and success rates of the operation. I felt very lucky to have him as my consultant." "Roy Chaudhary is a excellent consultant. Very caring. I had to have a very urgent operation on my neck in April and all his team have been brilliant. 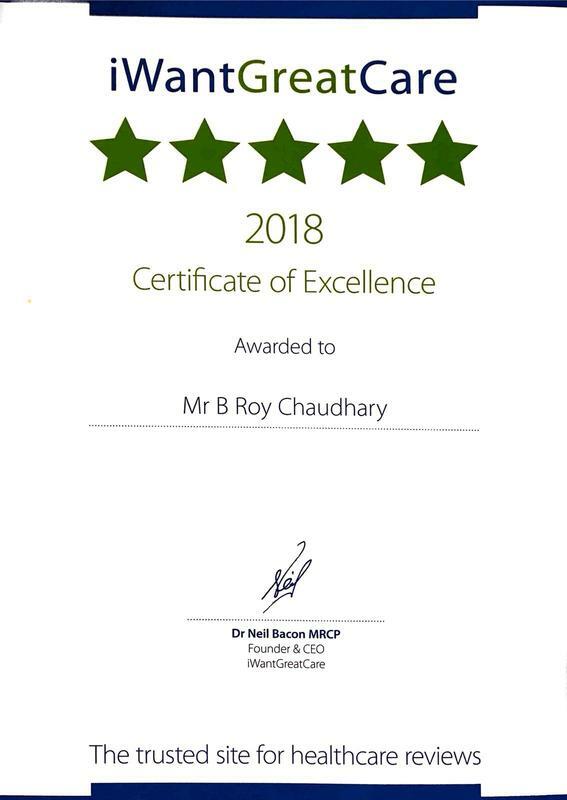 Many thanks and appreciation"
"The care that I received by Mr B Roy Chaudhary when I needed an emergency operation for my neck was second to none he was very good in all that he did for me the scar has healed well and it will probably not show in years to come. I cannot thank him enough for the quick decision that he made to make the operation possible,. Without the operation I would have been paralyzed. I cannot thank every body enough for all there compassion"
"He was as clear as can be about what was causing my problem and gave alternative approaches, including keyhole surgery, which we opted for. I must say it took visits to at least 3 other consultants and numerous scans over far too long before I was finally forwarded to Dr Chaudhary. An excellent result." "Procedure: L4/5 Keyhole Microdiscectomy & decompression of nerve root. ​....Roy is a kind, considerate, and bright physician, but also very personable. It seems that he's leading the foray into keyhole surgery for this sort of condition in Oxon. I can only commend him to would be patients. He's a busy chap and uses a sort of syndicated secretarial service for private patients. This did not wotk as smoothly as other Consulatnts that I've been under, so possibly an area for improvement. I hope this provides a useful insight into my journey over the last 12 weeks." "Having severe leg pain and sciatica I was referred to the Spinal Team at the Nuffield Orthopaedic Centre in Oxford. I was assessed by Mr Chaudhary at the Horton Hospital in Banbury and we discussed my medical history of back problems and also looked at a recent MRI scan. Mr Chaudhary is a good listener and we discussed the pros and cons of undertaking decompression surgery. He recommended surgery at the L3/4 level. His confidence, expertise and experience in minimally-invasive surgery was a turning-point for me in the decision-making process. I found Mr Chaudhary very knowledgeable and able to clearly present the issues involved. As with any elective surgery it is vital to feel confident that you have explored all the options, are aware of the risks and can feel ownership of the decision. Mr Chaudhary was able to help me decide to have decompression surgery whilst still feeling able to change my mind at any point. As it turned out the surgery was carried out successfully and although it was an early start I was home by 10.00pm on the same day. Mr Chaudhary checked on my recovery twice after the surgery and fully reported on what had happened. Having had conventional surgery at a different spinal level previously I cannot recommend the keyhole surgery enough as the recovery process is much quicker and being able to get home and back to some sort of routine so soon after the op is a huge plus." "Roy Chaudhary was a brilliant consultant as he kept myself and my partner informed at all times as to what was happening pre and post op. He also was very considerate about our family commitments and catered the procedures around us. All in all he was a fantastic kind and considerate consultant." "I was weeding and fell over. I was left with a very painful back and left leg. I had an MRI scan and this showed had compression on L4/L5. My doctor treated me pain relief and a visit to a physiotherapist. She examined me and said she was unable to help me, sending me back to my doctor advising my doctor I should see a neurosurgeon. 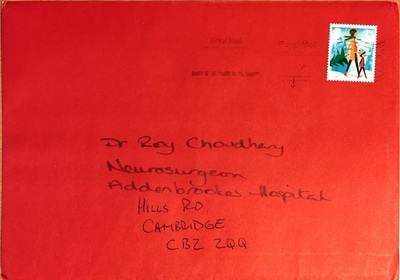 My doctor arranged for me to see Mr Chaudhary at Nuffield Orthopaedic Centre. He explained what he could do for me with keyhole surgery and the risks involved, he gave me confidence in him and his team. I had my surgery in February 2017. "The relief !" as up until I had the operation I was in constant pain and walked like a question mark. Mr Chaudhary is an outstanding consultant and surgeon I have no hesitation in recommending him and this team. I am very grateful for what he and his team has done for me. "Mr B Roy Chaudhary was my doctor during my fractured neck operation. He made me feel comfortable, and he also made me feel relaxed before and after my operation. Before my operation he met me before to go through what was going to happen, and comforted me, and this really helped because it calmed my nerves, and I knew that he would do a excellent job." "I have seen Mr B Roy Chaudhary twice with regard to clinical/spinal problems. On both occasions my husband and I were extremely impressed by the respect and courtesy he showed me and by his obvious expertise in his specialty. His explanations were clear and helpful. He has an excellent manner and a listening ear. On each of the two occasions mentioned above, he provided a full and detailed report for both my GP and I. I am due to be seeing him again in October 2017 and know that I will receive the best advice regarding my condition. Thank you." "I was seen at the Nuffield with back and leg pain. At every point of my treatment I received excellent care. Mr Chaudhary was the surgeon I saw and he took time to explain everything in detail and put my mind at rest regarding my procedure. My surgery was carried out swiftly and I am currently recovering well at home. Mr Chaudhary has excellent communication skills and it is clear he works hard to give his patients the best experience and outcome he can. If you are able to choose your surgeon I would highly recommend Mr Chaudhary. I feel very lucky to have received his care on the National Health! " "When I first met Mr Chaudhary, I had experienced severe pain for a prolonged period due to a L5/S1 prolapsed disc/nerve compression. I was at my wits end, taking so much pain medication and having had a nerve root injection which made no difference at all, I was feeling very vulnerable & emotional but Mr Chaudhary took the time to listen to me, as an individual and advise accordingly and very clearly explained the procedure and all associated risks. I have never had a hospital stay or operation before and again Mr Chaudhary and all the team at The Manor, Oxford were just wonderful. Mr Barker, the anaesthetist, also took the time to explain in full exactly what I would experience and followed up with a visit post surgery. The scar is minimal and with the non invasive surgery option that Mr Chaudhary offered my recovery period has been dramatically reduced and I am thankfully about to start my physio which considering only 5 weeks ago I could barely walk, is for me an absolute miracle. ​I cannot recommend Mr Chaurdhary and his team highly enough." ​Thank You Mr. Chaudhary you have given me faith in the National Health again"
"I went into hospital in a great deal of pain needing c4/5 removed, the surgery went very well and when I woke from the operation I instantly felt 80% less pain which is continually improving, I managed the recovery well and left hospital 24 hours later, the after care was excellent, and may I add the Nuffield was extremely clean and staff very efficient. Mr Chaudhary is a brilliant surgeon and I would recommend him 100% he explains things very well and leaves you feeling you understand the process well. Thank you for the great care"
"After suffering with pain on a daily basis for over two years, I finally made my way through the system to Mr Chaudhary. He is an affable chap, which instantly put me at ease. He understood the dynamics of my home/work situation and spoke to me in terms of solutions with minimal impact. He performed a key hole discectomy and has changed my life completely. The operation was a great success and I am now virtually pain free, something I never thought I would achieve again. I can not thank this man enough and would highly recommend!!" ​"My initial response to the surgery is really positive. I could not put my right heel on the floor and walk properly prior to surgery. I can now do so. Clearly the right leg will take some physio and training to be functioning properly but I am walking now with a normal gait, rather than on tip toes as previously. I would like to thank Mr Chaudaray as it is only as a result of the keyhole surgery that this has happened. I assume this result is because the tethered nerve has been released. It is now my second day of recovery and I am able to walk round the garden. I am positive that within a few weeks I can return to my normal running regime. I found the key hole surgery so beneficial because it has minimised the amount of time I have had to take off work for recovery and also minimised the time needed to stay in hospital. The wound is small and not as invasive as I had expected. THis I hope will hasten recovery - my motivation is to be fully back to work and full quality of life as quickly as possible. I am in the midst of a fast track senior leadership programme sponsored by the Home Office and quick recovery is therefore important to me." ​Patient feedback email - published with permission. "For the last two years I have suffered from constant pain across my lower back, buttocks and down the right leg. Having been informed by the Spine Clinic at Nuffield Orthopaedic Centre that my pain count did not warrant an operation, I referred myself to Mr B Roy Chaudhary for a second opinion. He diagnosed stenosis in the lumbar region which was confirmed by MRI scan as severe at L4/L5. He recommended keyhole surgery and stated clearly that this would either reduce the pain or remove it but it would not affect the limp that had developed in my right leg over a long period. I opted for the surgery. ​Mr Chaudhary and his team performed an excellent operation which has removed the pain allowing me to proceed with previously impossible physical exercises to tackle the limp. Mr Chaudhary is a very pleasant, excellent surgeon and I would recommend him wholeheartedly to anyone with back and leg pain. His team also deserve a mention as being personable and very efficient." ​"I was admitted to the Nuffield Orthopaedic Centre in September 2016 for a discectomy under the care of Mr Chaudhary. Prior to the surgery I was experiencing excruciating pain on a daily basis, post surgery I am now pain free. I could not have hoped for a better result. I am extremely grateful for the excellent care that I received. Having never undergone surgery before it was important to me to feel at ease and confident with the person that would operate. After our initial consultation I had every confidence in Mr Chaudhary and the care I would receive. An excellent surgeon whom I would highly recommend." "​Excellent care and clear communications left me in no doubts before, during and now after my surgery. Mr Chaudhary instilled me with complete confidence in himself and his team and I can think of no other I'd rather have had look after me." "I had severe lower back and leg pain and from the outset Roy Chaudhary took time to explain all the possible procedures to deal with the problem. With the information provided he made a fast and clear diagnosis making it easy for me to understand and make decisions upon. Within two weeks I was admitted and had key hole surgery and literally from not being able to move without pain to within 3-4 hours of having had the procedure was able to get up and walk with no pain. The aftercare was brilliant with Roy and his team remaining very attentaive while in hospital over night. I wouldn't hesitate in recommending Roy Chaudhary based on my experience, he's personable, highly skilled and made sure through all stages of the process I was keep informed and comfortable." "My mother had an operation at the Manor Hospital in December 2016. Mr. Chaudhary was friendly and approachable and the whole experience was as stress-free as is possible when you have a family member in hospital. On the day of the operation he spent time with us answering all questions/concerns. Lovely man, we can't fault him at all and probably more important, the objectives of the operation seem to have been achieved so far and mum has far less pain. Absolutely recommend." "Highly skilled surgeon who talked me through all the pros and cons of surgery. Good result from surgery which cured by leg weakness." "I had a keyhole L5/S1 lumbar microdiscectomy under the care of Mr Chaudhary. From start to finish I felt very comfortable under his expert care and he explained everything very clearly and in great detail. After going through my MRI results and deciding I wanted to go ahead with surgery I told him I was going on my honeymoon in a matter of weeks. Mr Chaudhary did all he could to get me through surgery as soon as possible as my husband and I didn’t want to take the risk of going away knowing the disc prolapse could get worse and have possible life changing consequences. The surgery went well, 12 hours later I was at home and 12 days later I was on a plane to the Philippines. I’m now 8 weeks on and feeling brilliant!" 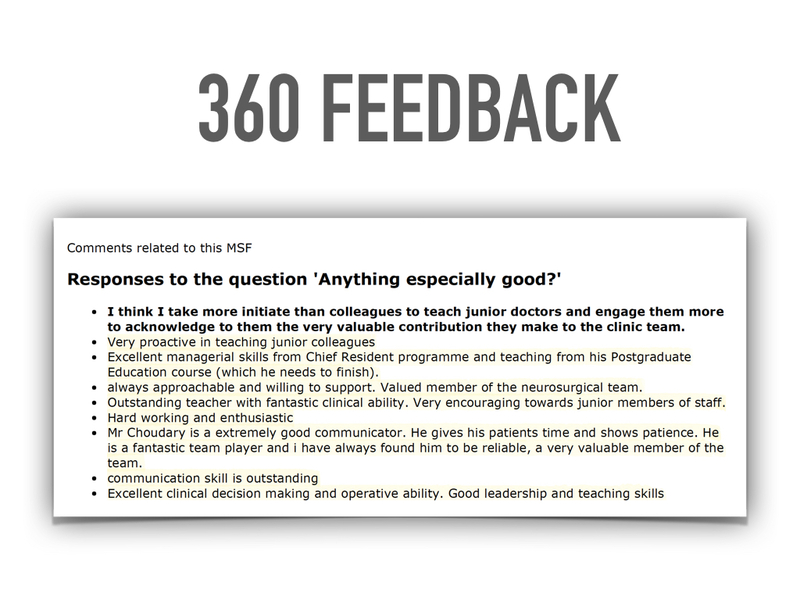 "I was actually treated by Mr Chaudhary at the Nuffield Hospital, Oxford where I was given his undivided attention and can't praise his expertise highly enough. 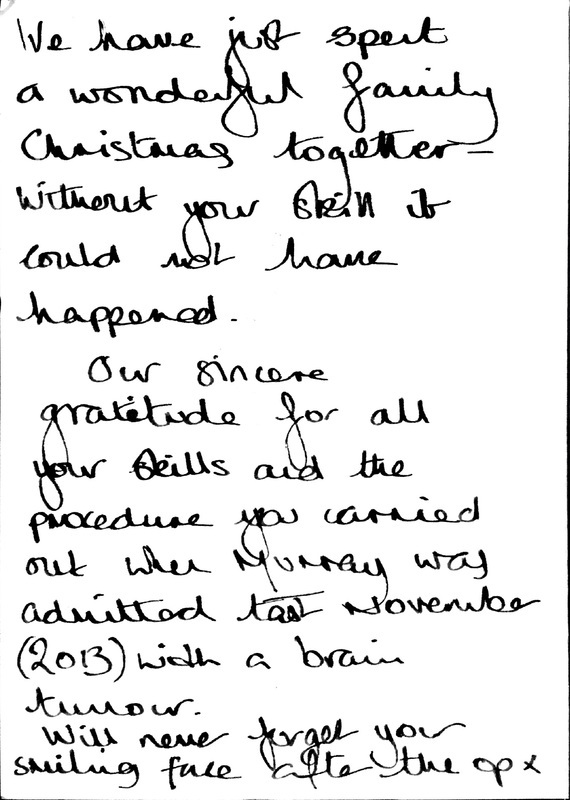 Many thanks"
"When we arrived for my daughter's surgery, we were extremely apprehensive. During the months of symptoms and distress she had been experiencing we had become increasingly disillusioned about the seeming lack of interest and care she had been shown after seeking help on many occasions from practitioners in our home town. Because of this, our expectations were low when we arrived in Oxford Within a very short time of meeting Mr Chaudhary and some his team, that changed. Mr Chaudhary was extremely personable, explained my daughter's condition and the planned procedure, spoke to us both in plain language and willingly answered questions. Whilst pointing out the risks as well as the benefits of surgery for my daughter, he also offered reassurance and displayed confidence in the abilities of himself and the team to deliver a good, safe outcome from the procedure. The combination of his clear knowledge and expertise and his very personal and caring approach relieved many of our fears. For the first time since my daughter's symptoms began we both felt like she was receiving care as an individual and was in safe hands. These comments also apply to all members of his team that we came into contact with. Mr Chaudary's explanation that if the surgery took a bit longer than expected, it did not indicate a problem was also very reassuring as I was waiting for my daughter to return after surgery. As promised he phoned me when she was taken to recovery to let me know it was over and that the surgery had gone to plan without complications. The whole experience was made so much better by Mr Chaudhary and his colleagues' kind and helpful approach and we are very grateful for both their clinical skills and their human touch." "Mr Chaudhary spent time explaining my condition, the primary aim of treatment, details of the procedure, risks and the likely outcome. This was hugely reassuring given the severity of the condition and the speed with which it was dealt. He was also available post-operatively and in the weeks following surgery for any questions I had during recovery which helped manage my own expectations of the healing process. Mr Chaudhary has my very great thanks and respect." "From the first moment my husband and I met Mr Chaudhary, we were overwhelmed by his professionalism and knowledge. I was diagnosed with nerve root compression L5/S1. Mr Chaudhary suggested he carry out keyhole discectomy to remove the protruding part of the disc. Mr Chaudhary's bedside manner is second to none. Just hours after my operation Mr Chaudhary came to my bed side and he personally assisted me out bed and walked with me. Mr Chaudhary also has a very strong and loyal team around him, which helps relax and support the patient. I found the complete experience throughout Mr Chaudhary and his team very professional, relaxing, secure and the feedback once I reached the ward by the team was exceptional." "I really appreciate all the care and expertise of you and your team. Having been in Warwick for a week with uncertainty and very poor support it was an incredible relief to be met with the professionalism of he Trauma Unit. The health carers, nurses, anaesthetists and the surgery team all have been amazing. I can't believe I feel as well as I do. ​Thank you so much. Please let me know if I can ever help the unit in anyway at all." ​"I had a keyhole microdiscectomy surgery by Mr Chaudhary and the operation went well. I understood my scar would be much smaller than the standard (non-keyhole) technique, and I was able to go home in the evening. It has been a week since my surgery and recovery is as expected. Mr Chaudhary clearly explained his keyhole technique and the risks involved in the surgery during the pre-operation consenting process. For those suffering from the condition microdiscectomy is definitely worth considering. My sciatic pain disappeared immediately, and with the added benefit of coming off various painkillers." "Mr Chaudhary was kind enough to make himself available to see me at short notice and took time to review third party scans and reports. He was professional, as expected, but also engaging and understanding. He took time to discuss options in detail and skilfully involved me in the decision making process for my spinal issues. There is more than comfort in knowing that your surgeon understands your problem!" "Good listener; gave clear explanation of likely outcome before MRI scan, and then very clearly described the findings and implications for management. Very impressive all round. Nice man." "I attended two appointments with Mr B Roy Chaudhary. Both sessions were very informative and to the point. Different options were discussed and by the end of the 2nd session, I chose my preferred option without feeling pressured." "this doctor really went that extra mile . I was 17 when i injured my back playing football after seeing many doctors and physios i was referred to see dr chaudhary he spoke to me in a way i fully understood my injury and then gave me options of how we could treat it together I opted to have keyhole surgery to repair the disc problem that was causing so much pain and restriction . I was in hospital for one night and home the next day . after some intense physio I am now playing football again . I would reccomend this type of surgery for young people.in my position and old alike all i say is a huge thank you to dr chaudhary and team and jo sheehan physiofor giving me my life back"
"I had my operation under Mr Chaudhary for trapped nerves which I am glad to say was a great success. From start to finish I felt very comfortable under his expert care. He explained everything in great detail and is truly a great surgeon. Many thanks N"
"Dear Mr Chaudhary,I can't thank you enough for today's appointment. You were welcoming, unhurried, listened, you examined me thoroughly, you explained everything in detail, you involved me in the decision making. You could not have inspired more confidence nor have been nicer. Thank you." - Patient and retired Oxfordshire GP. "Mr. B. Roy Chaudhary and his team provided exceptional service beyond my expectations. He is an excellent surgeon, and I would recommend him to anyone in need of spinal neurosurgery." "...I'm just so glad you saw what no one else did. I can't say thank you enough. Hope you enjoy the chocolates...I'm happy to complete anything else to show what a fantastic surgeon, team and hospital you all are and hopefully help other people. I will miss all of your team's support." - Patient after minimally invasive tubular keyhole discectomy. "From the initial assessment through to treatment I've received a high level of professional care from Mr Chaudhary and his medical team. He has spent a good amount of time to ensure I fully understood my condition and explained in great detail the treatments available to me. 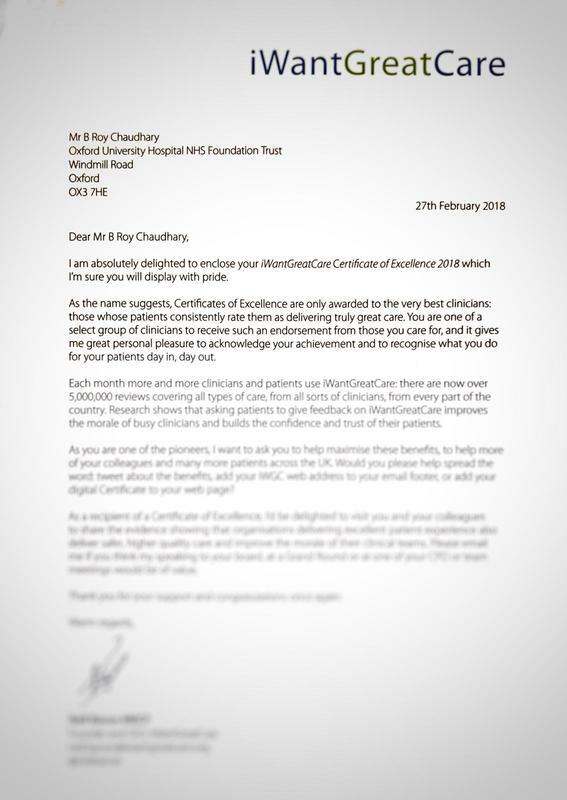 During my treatment it was also very reassuring to hear that Mr Chaudhary and his team hold a very high level professional regard amongst the staff at the Manor Hospital." 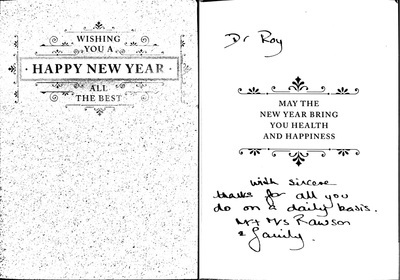 "Huge thank you to Mr Chaudhary who operated on my spine. He is truly an incredible surgeon who made me feel as comfortable as possible and endsured my family was always aware of what was going on. Would recommend him to anyone." "I came in as an emergency to be under the care of Dr. Chaudhary. I'm so glad he was on call that day! From the first time I saw him to the appointment I was discharged back to my GP, he has been so lovely, patient, sympathetic, realistic and put me at ease. There is nothing I think he needs to do differently. Big thank you to Dr. Chaudhary, ward D and all other staff involved in making me better." "I have just got home after spending just two days in the Nuffield hospital after my operation performed by Mr Chaudhary and Mr Simon ? From South Africa. My care by the nursing staff from start to finish was of the highest standard to the anesthetise who sang me to sleep I was under the very best care. So thank you Mr Chaudhary you are truly a top surgeon and the very best to you and your family Noel." "very helpful when consulting as a colleague for advice in regards to a number of complex patients. staff were good to liase with too." "I had a redo Chiari decompression along with duraplasty at the end of Sept, 2014. Dr Chaudhary was at Toronto Western hospital on a fellowship during this time. I was in the hospital recovering for 9 days. During my recovery, Dr Chaudhary was fantastic. He always made sure that I understood what was going on, was always available if I had questions, and was generally just a really nice man! He really aided in my mental recovery as well as my physical one. He was patient and kind and I felt extremely lucky that he was looking after me." Review from patients undergoing Spine Surgery and Microsurgical Spinal Neurosurgery including Keyhole Minimally Invasive (MIS or MISS) Spinal Surgery for spinal stenosis, disc prolapse, cervical myelopathy, spinal trauma etc. in Oxford and London at the NHS Oxford University Hospitals NHS Foundation Trust and Private Hospital The Nuffield Manor Hospital, Headington, Oxford under the care of Mr B Roy Chaudhary.